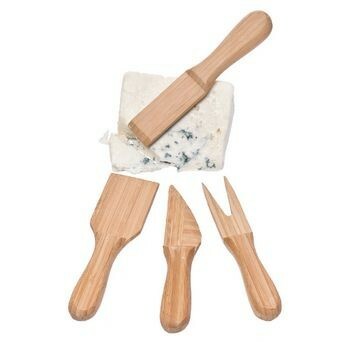 A unique set of small cheese tools carved from laminated “environmentally green” bamboo. The tools include a Hard Cheese Knife, Cheese Fork, Medium Cheese Knife and a Semi Soft Knife. All are 5-3/4” long. Imprint area: 2-1/2” X 2-1/2.” Laser engraving available.